A three-year-old boy died after sustaining 13 blows to the head, a Londonderry court has heard. It is alleged toddler Kayden McGuinness received these blows at the same time and one or more of them caused a subdural haemorrhage, leading to swelling of the brain and his death. Pathology reports suggest that the child would have survived for half an hour after the fatal injury had been sustained. 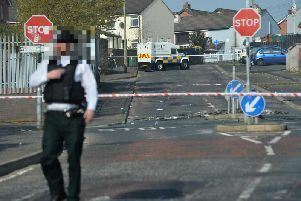 Details of the post-mortem report were disclosed as 23-year-old Liam Whoriskey applied for bail. Whoriskey, of Glenabbey Gardens, is charged with the murder of Kayden on September 17, 2017. Londonderry Magistrates’ Court heard allegations that Whoriskey was left alone with the toddler and his six-month-old sibling. It is alleged their mother had left the house to attend a family gathering and had put the children to bed beforehand. Whoriskey found Kayden dead the following morning. During police interview, he claimed he had heard the child laughing and playing for a time after the mother had left, but did not see him alive again. He said he watched TV and consumed four Guinness and woke up on the sofa the following day before finding the child dead. A post-mortem was carried out over two days and police received the pathologist’s report in May. It disclosed multiple injuries sustained by the boy. The court also heard allegations that the child had also sustained other injuries, including two black eyes and a fractured rib in the weeks prior to his death. It is alleged a photograph had been posted on social media of the child with two black eyes. Whoriskey was questioned about this and he allegedly told police the child had hit himself with a toy. He also allegedly admitted he was the only person in the house when this injury was sustained. Police opposed bail for fear of further offences, concerns that Whoriskey would breach conditions and concerns that his release would lead to public disorder. The court heard the defendant has previous convictions for domestic incidents involving an ex-partner. Whoriskey was remanded in custody to appear in court again via videolink on July 23.